Index on Censorship Report: Burma is at a crossroads. The period of transition since 2010 has opened up the space for freedom of expression to an extent unpredicted by even the most optimistic in the country. Yet this space is highly contingent on a number of volatile factors: the goodwill of the current President and his associates in Parliament, the ability of Aung San Suu Kyi to assure the military that her potential ascendancy is not a threat to their economic interests and the on-going civil conflicts not flaring into civil war. The restrictive apparatus of the former military state is still available for the government to use to curtail freedom of expression – the most draconian laws are still on the statute book affecting the media, the digital sphere and the arts; police and local authorities have significant discretion when it comes to approving speech and performance, and the judiciary has a limited institutional understanding of freedom of expression. In effect, the old state remains in the shadows – or as one journalist told Index: “the generals have only changed their suits”. Yet Burma has changed. The country is freer than it was during Index’s mission in 2009, when meetings were held in secret. In March this year, Index co-produced a symposium on artistic freedom of expression with local partners, the first public conversation of its kind in recent history. The abolition of pre-censorship of newspapers and literature, the return of daily newspapers, the release of political prisoners and the open space given to political debate all signal real change. The question for the government and the opposition is: will the transition be sustained with legal and political reform to reinforce the space for freedom of expression and to dismantle the old state apparatus that continues to pose a threat to freedom of expression? This paper is divided into the following chapters: Burmese politics and society; media freedom; artistic freedom of expression and digital freedom of expression. The report is based on research conducted in the UK and 20 interviews (with individuals and groups) in March 2013 conducted in Mandalay and Yangon. Due to the ongoing possibility of future prosecutions, the interviewees have been kept anonymous. Politics and society looks at the role of the President, United Solidarity and Development Party (USDP), Aung San Suu Kyi and the National League for Democracy (NLD) and the student movement and freedom of expression, ethnic conflict and the constitution and the need for reform, freedom of association and freedom of assembly. The media freedom chapter looks at the press council, existing impediments to media freedom, the state of media plurality and self-censorship in the press. The artistic freedom of expression chapter covers theatre and performance art, literature, music and film. Finally, the digital freedom of expression chapter looks at access issues, the impact of new technologies and state censorship on the digital sphere. The report is based on a series of interviews conducted in Rangoon and Mandalay in March 2013, with additional interviews conducted in April 2013 in the same cities. Prepare a roadmap in this session of parliament that lays out how Burma will reform the legal framework that curtails freedom of expression. The reform must curtail the emergency legislation imposed by the military regime; end the licensing of newspapers and decriminalise defamation, open up access to the internet and remove restrictive laws that penalise its use and annul provisions in the penal code dating from British colonial rule that criminalise political speech and freedom of association. The EU, US and other partners must be prepared to revisit sanctions if the government of Burma fails to deliver this roadmap. Abandon the restrictive press law put forward by the Ministry of Information and allow the Press Council to continue to lead on the process of drafting a new legal framework for the press and other media actors. 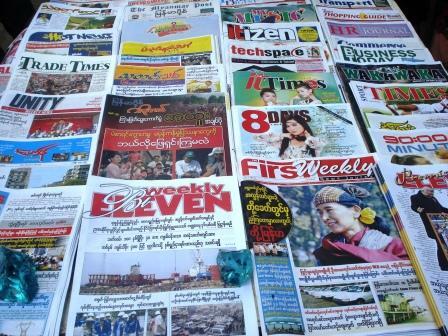 Prior to enacting a new legal framework for the press, the use of emergency powers to ban the publication of media in Burma must be stopped. Bureaucratic hurdles to freedom of expression should be removed immediately, in particular the requirement for permits for public performances (live music, public art, political readings) to be signed off by multiple layers of government. The government should give clear instructions to local police forces that the use of restrictive legislation to stop peaceful public demonstrations is excessive and should be stopped in particular Article 18(b) of the Peaceful Assembly and Peaceful Procession Law and section 505 of the penal code. …and its GDP ranks 77th in the world. 2. Tay Za was bribed 50 million US$ by the Chinese for brokering the Letpadaung copper mine (see: http://www2.irrawaddy.org/article.php?art_id=23270&page=2) which Suu Kyi endorsed strongly in spite of the phosphorous bombs thrown by Chinese-controlled local police at the local farmers who were desperately protesting to save their ancestral farms from being poisoned by the greedy Chinese and their junta stooges.